The Food Network superstar and New York Times bestselling author dishes up flavorful All-American family-friendly meals for weeknights and weekends alike. As one of Food Network's biggest stars, Guy has taken America on a cross-country tour in Diners, Drive-Ins and Dives. He's challenged great home chefs at their culinary expertise in Guy's Grocery Games. He's shared his greatest hits in Guy Fieri Food, and went all out in the great outdoors in Guy on Fire. Now, in Guy Fieri Family Food, he brings fun to the table with delectable dishes everyone will love. Family meal planning couldn't be easier with Guy's tips, fun-filled ideas, and best-loved recipes. Influenced by his Californian background, this full-color cookbook is packed with fresh, flavorful recipes, fabulous photos, and, of course, Guy Fieri flair. Every family favorite is here, from burgers and sandwiches to grains and greens to pasta and noodles. Guy even includes chapters like One for the Week, a budget-friendly big weekend cook "that keeps on giving through the hectic workweek"; All Hands on Deck, with Kebab Night, Pizza Night, and a Chili Bar that get the kids involved; and Under Pressure, where hearty dishes are made in the pressure cooker in a fraction of the time they usually take. Whether it's Turkey and Roasted Poblano Burger with Crushed Avocado, Fire-Roasted Fieri Lasagna, Buffalo Chicken Soup, Sweet Italian Pepper Poppers, Balsamic BBQ Short Ribs, or Deep Fried Ice Cream "Boulders," Guy Fieri Family Food includes tasty, crowd-pleasing meals that make weeknights easier, weekends more fun, and everything more delicious! Guy Fieri Family Food is illustrated with color photos throughout. In 2006, Guy Fieri premiered his first show, Guy's Big Bite, on Food Network after winning season two of The Next Food Network Star. 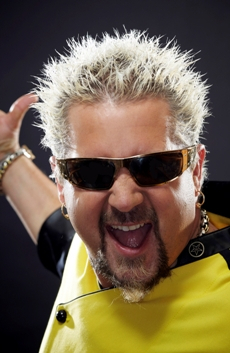 Today, this "culinary rock star" hosts two additional top-rated shows on the network: Diners, Drive-Ins and Dives and Tail¬gate Warriors. And on March 14, 2010, Guy made his debut as a game show host on the NBC prime¬time series Minute to Win It. In 2011, Guy officially launched CWK (Cook¬ing with Kids; www.cwkfoundation.org) , a program that encourages developing healthy eating habits to address the childhood obesity crisis, strengthen the family unit by sharing quality time in the kitchen, and as a result increase our children's self-esteem in a fun and positive way. Guy's first two books were the New York Times bestselling Diners, Drive-ins, and Dives: An All-American Road Trip . . . with Recipes! and More Din¬ers, Drive-ins and Dives: Another Drop-Top Culinary Cruise Through America's Finest and Funkiest Joints. Guy owns five restaurants in Northern Califor¬nia, including three Johnny Garlic's and two Tex Wasabi's, and resides in Northern California with his wife, Lori, and two boys, Hunter and Ryder.